Mohanlal's Onam release Velipadinte Pusthakam is slated to hit the screens on 31 August. The film, directed by hit maker Lal Jose, has been produced by Antony Perumbavoor under his home banner Aashirvad Cinemas. Written by veteran scenarist Benny P Nayarambalam, the film will have music by Shaan Rahman. Velipadinte Pusthakam is also the first Onam release among the four superstar Onam releases. While the film is just hours away for its theatrical release, here is why Catch feels this Lal Jose film could be another blockbuster for the Malayalam superstar. An Onam without a Mohanlal film is unimaginable for the Malayalam film lovers. In fact three of Lalettan's previous Onam releases, Peruchzhi - 2014, Loham - 2015 and Oppam - 2016 were clean hits at the Box Office. Especially Oppam, which turned out to be the third all-time Malayalam grosser after the Mohanlal blockbusters Pulimurugan and Drishyam. With Velipadinte Pusthakam, Mohanlal will be looking to maintain his successful track record in Onam periods. Velipadinte Pusthakam marks Mohanlal's first collaboration with hit maker Lal Jose. Lal Jose, who had directed many super hit films, hasn't made any film with Mohanlal in his 19-year-long career. Lal Jose also stated with Velipadinte Pusthakam will be a good family entertainer not just for his fans, but also for whole audience as well. The music of Velipadinte Pusthakam has been composed by Shaan Rahman, who's currently riding high with back-to-back musical blockbusters Oru Vadakkan Selfie, Jacobinte Swargarjyam and Godha. His song from Velipadinte Pusthakam, 'Entammede Jimikki Kammal' written by Anil Panachooran and jointly sung by singer-director-actor Vineeth Sreenivasan and singer of Kamal Haasan's Uttama Villain, Renjith Unni has already emerged as a chart buster song. The song has been welcomed by non-Malayalam audience as well, which are sure to attract the audience in non-Malayalam markets as well. Velipadinte Pusthakam also marks the second film for the stars of Angamaly Diaries, Reshma Rajan and Sarath Kumar, who had brilliantly portrayed the roles of Lichy and Appani Ravi respectively in the latter film. Reshma Rajan portrays the female lead as a college teacher in Velipadinte Pusthakam while Sarath Kumar will be seen as a college student. 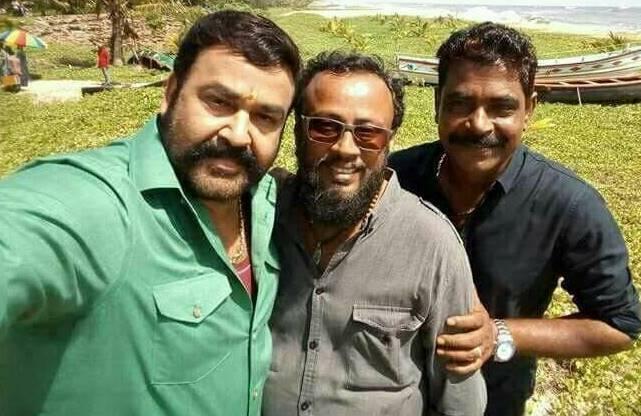 While the first look poster of Velipadinte Pusthakam was released, it was reported that Mohanlal portrays the role of a vice-principal of college in the film, named Michael Idikkula. However the makers have succeeded in bringing curiosity among the audience by revealing the 5-time-national-award winner in a mass look. The second teaser, which had released on Tuesday also suggest that Velipadinte Pusthakam is not just a campus entertainer, but also an action entertainer as well. Velipadinte Pusthakam also stars Salim Kumar, Anoop Menon, Kalabhavan Shajohn, Krishnakumar, Priyanka Nair and Shivaji Guruvayoor. The cinematography of the film has been done by Vishnu Sharma.